John Kavanagh delivers his pre-fight thoughts from New York ahead of Conor McGregor’s bid for history. WHEN MIXED MARTIAL arts first came into my life, the biggest events in the sport were held in small, dimly-lit arenas in front of modest crowds in US towns that I’d never heard of. MMA was banned in the state of New York, so the thought of seeing an event take place at Madison Square Garden, the greatest colosseum in combat sports, seemed preposterous. We’ve spent so much time in Las Vegas over the last couple of years that this event was always going to feel much different, and that’s certainly been the case. It’s been a really enjoyable week here ahead of Conor McGregor’s lightweight title fight against Eddie Alvarez tonight. I’ve been able to get out of the hotel and see the surroundings a lot more than I do when we’re in Vegas, which has allowed me to get a feel for the atmosphere. Everything has been great, it’s a privilege to be here and we’re looking forward to putting a nice exclamation mark on it tonight. To now be just hours away from being part of the first MMA event in New York City, it’s quite surreal when I stop and think about it. I’ve been doing my best to take it all in, because there’s only ever one first. I’ve spent a lot of time over the years defending this so-called “barbaric” sport, but this feels like another step closer to no longer having to do that. There’s so much history at Madison Square Garden that it’s impossible not to be impacted by it. We’ve been working in some of the gyms here over the last week or so and they all seem to contain some reference to the great Muhammad Ali-Joe Frazier bouts that took place at the Garden, whether it’s a poster or some other form of memento. Today is also the UFC’s birthday — as well as my fiancée Orlagh’s, I should add — so it seems fitting that such an important occasion in UFC history should fall on this date. Many years from now, I’m sure I’ll look back at some images and footage from tonight and maybe then the significance of it will sink in fully. 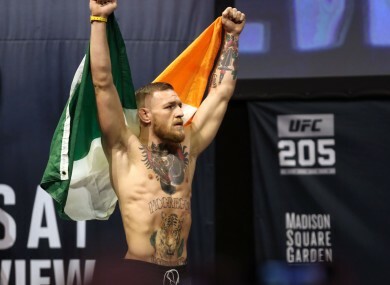 After watching the Ireland rugby team’s incredible victory over the All Blacks last Saturday, it has spurred us on even more to ensure that Conor achieves the unprecedented by winning a second UFC title. Maybe a few years ago Irish teams and athletes didn’t expect that much of themselves when they went to compete abroad. It was a case of put your head down and do your best. But now we expect and demand excellence. The Irish fans got it from the rugby team last weekend; tonight they’re going to get it from their MMA team. It’s a bad cliché but the build-up couldn’t have gone any better for Conor. I’ve said many times now that I believe lightweight is his ideal weight class and we were also able to prepare at home in Dublin for the majority of this training camp, which I believe is what suits us best. The weather is also similar to back home and the event itself has really captivated Conor. The support at the weigh-ins last night was incredible. Even walking around the town you can feel it. The proprietors in the bars and restaurants have been telling me that they haven’t felt anything like this in a long time. It has already been something very special but we’re confident that the best is yet to come. Poll: Will Conor McGregor make history tonight in New York? Email “'Our rugby team have spurred us on to make it another memorable night for Ireland'”. Feedback on “'Our rugby team have spurred us on to make it another memorable night for Ireland'”.